‘The ABC of planting trees’ is a simple, no nonsense, step by step guide to purchasing, planting and caring for trees. In this guide, you have everything you need to know if you wish to plant a single tree in your garden or a woodland on your land. Planting a tree is a wonderful way to mark a birth or commemorate the death of a loved one. 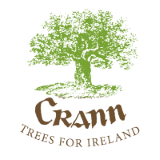 Crann hopes that this booklet will encourage more people to plant and enjoy our wonderful heritage of trees and woodlands. This full colour, 28 page booklet by Steven Meyen is available to order from Crann. Send your order with €5 per copy (including P&P) cheque/postal order (payable to Crann), P.O. Box 860, Celbridge, Co. Kildare. Please include your full name and postal address and we shall post your order to you.